Just like its sister-park to the North, the Embarcadero Marina Park South is a picturesque park that sets on the edge of San Diego Bay. 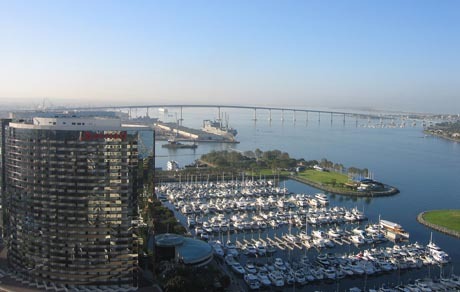 It has closer views of the Coronado Bridge, yet nearby the San Diego Convention Center and within walking distance of downtown San Diego CA, Petco Park, the Gaslamp Quarter, Seaport Village and joins with the Embarcadero Boardwalk. The park amenities include shade trees, lush landscaping, bike path, exercise stations, gazebo, picnic tables, concessions, a fishing pier, convenient parking and a gentle ocean breeze. 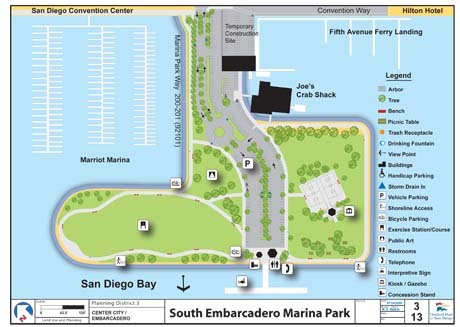 The Embarcadero Marina Park South is located at the foot of Marina Park Way which extends from Convention Way. The park has convenient parking but if you prefer not to drive, the San Diego Trolley station is nearby. Click map for an enlarged view. Can be reserved for special events. Maximum occupancy for events is 5,000. Weddings and receptions are permitted. Alcohol or glass bottles are not permitted. Dogs on leashes are permitted. Guidelines apply. Park Hours: 6:00 AM to 10:30 PM.